At Foreign Policy magazine, Christian Caryl explains the plight of little-known Sudanese human-rights activist Jalila Khamis Koko, who faces execution at the hands of her country's government. It's all because she made an entirely nonviolent protest video drawing attention to violence against a persecuted ethnic minority. Read some of her story and learn what you can do to help at Foreign Policy. You've probably never heard of Jalila Khamis Koko. As for me, I've only read about her. But it's quite clear from what I've read that she's an extraordinary person. Her life story has the same improbable trajectory as that of so many other human rights activists around the world. A 43-year-old elementary school teacher, wife, and mother isn't necessarily the sort of person you'd expect to confront one of Africa's most vicious governments. But that's what she's done…. Jalila responded by turning her home in Khartoum, the Sudanese capital, into a refuge for those fleeing the fighting. By this spring around two dozen people were living there. But what really drew the attention of the Sudanese authorities seems to have been her outspoken criticism, in a now-notorious video published in June 2011, of President Omar Hassan al-Bashir's brutal treatment of her fellow Nubans, the majority inhabitants of South Kordofan. (Like so many other of Sudan's ethnic minorities, the Nubans, who are not Arabs, have persistently resisted Bashir's efforts to make them conform with his own ethnic and religious definition of what "proper Sudanese" are supposed to be.) She also had the temerity to call for an immediate ceasefire in the conflict. Note: That's all she did: criticize. Her protest was entirely non-violent. She harmed no one. On March 15, in the early hours of the morning, the Sudanese secret police — the notorious National Intelligence and Security Services (NISS) — showed up at Jalila's home and took her away. She's been imprisoned ever since. 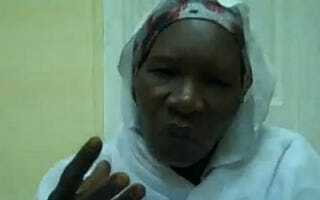 Just last month, according to Amnesty International, a Sudanese court sentenced her to death on treason charges. She could be executed at any time.